The Internet is BIG! Very big. However it is dominated by just a few hundred organisations and their websites. So how big is the Internet? How many websites are there? According to the Netcraft January 2018 Web Server Survey there are 1,805,260,010 (over 1.8 billion) websites. Yes, the Internet is very big. However, most of those websites get almost no visitors. How Many Websites Are Active? The size of the Internet can be measured in various ways, including totals such as: How many websites are there? How many domains are registered? How many websites are being used? What are the most popular web sites? How much storage is required to hold all the web data? How much data is transmitted? Etc., etc. The trouble is the Internet is so big that these totals and numbers change all the time. 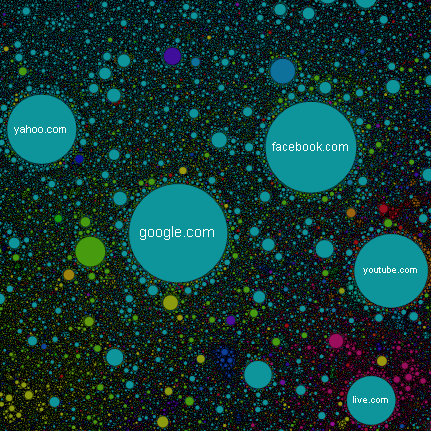 For this brief look at the size of the Internet the total number of websites is examined. In other words you can type a unique domain name into your browser’s address bar and you will get a response. When this article was first written in 2014 it used the Netcraft January 2014 Web Server Survey. Then there were 861,379,152 websites. During 2014 the total number of websites exceeded 1 billion for the first time (in September). The number of web sites peaked at 1,028,932,208 in October 2014 before falling back below 900 million. Had the world enough web sites at that time? Especially as mobile phone apps have become so popular as a way of accessing Internet services. Despite the number of websites staying below a billion for a while, the peak had not been reached. It was not until March 2016 that the billion website mark was broken again, at 1,003,887,790 sites. This time not falling back. Indeed 2016 saw big growths in websites with Microsoft being the big winner. Their web server platforms and Azure cloud offering seemed to be hitting all the right notes. However, as with all things in computing nothing lasts for ever, and the NGINX web server is now on the rise. What is the Total Number of Domains in the World? Those of you that don’t understand the workings of the Internet may not realise that the 1.8 billion plus website number is just over three times larger than the number of registered domains. Why? According to the Verisign Domain Name Industry Brief the total number of registered domain names in Q4 2017 was 332.4 million. So 330+ million domains support over 1.8 billion websites. But not all registered domains get used. Some are just registered so that no one else can register them. Some are registered and never used. When this post was first written in January 2014 the ZMap project, a high speed open source network scanner, had scanned the entire Internet and estimated the total number of hosts at 108 million. Then it was likely that the then 861 million websites were active on 108 million hosts. This is because a domain can be divided into sub-domains. For example a blogging website, such as Blogger, WordPress or Ghost, will let a user create a website that hangs of the main domain name, e.g. http://googleblog.blogspot.co.uk. The January 2018 Netcraft Survey reports 7.2 million (7,228,005) web facing computers. So 7.2 million computers serve up 1.8 billion web sites. Most of these sites are static and hardly change. Netcraft estimates that there are 172 million active sites (those that get regular changes). The number of active sites has fallen slightly from 177 million in 2015. Despite the huge growth in websites only around 10% contribute fresh information to the Internet. That is a lot of underutilized resources and a lot of wasted money. Despite there being over 1.8 billion websites only a few hundred dominate the Internet. Less than 1 million, or 0.1%, account for over 50% of web traffic. To get an idea on how much such a small percentage of the total websites dominate look at The Internet Map. Or Icons of the Web. The website Alexa lists the world's top websites. served up by 7.2 million computers. With 1.8 billion websites, if you publish a website it is very unlikely it will get noticed... Unless you are prepared to produce quality content, perform Search Engine Optimisation (SEO) and spend on marketing. Or you may get lucky, and be the next big thing, as all the top sites were once. Kween KleoKatra on February 18, 2015 at 4:21 pm said: Help! This post is dated January 2014, however there is 2015 data included. How? Tek Eye on February 20, 2015 at 9:33 am said: The post was first published in January 2014, and was then updated this January (2015). Shaheryar Sam on July 8, 2015 at 12:42 pm said: Its really helpful news thank you. Jesmina Sultana on October 3, 2016 at 8:33 am said: Nice website. Shania Williamson on March 9, 2017 at 12:41 am said: You are acuter with your answer. Thomas on April 23, 2017 at 4:26 pm said: The internet is too flooded with websites and many people are sick of it, bottom line with the gigagiants taking over the little guy has no chance. Tek Eye on April 23, 2017 at 11:19 pm said: The gigagiants won along time ago. But the world is big enough for niche websites. Find your passion and produce good content, keep producing content to fill the niche. Meet the needs of a target audience and promote it on social media. If you get to 50,000+ page views per month you are in the top 0.1% of world websites. 99.9% of websites get almost no traffic. Even the gigagiants started out with no traffic, but they found an idea that worked. See the list of all the Tek Eye articles in the Tek Eye website index.